When people meet me, they ask me this redundant question about travel and most of them express their jealousness on hearing my hypermobility. Elite forms of movement, such as for business, holidays or diplomatic journeys, are largely shown in a positive light in contemporary societies. Although there is unevenness in the portrayal of corporeal mobilities with growing fear over epidemiological threats facilitated through global mobility, negative representations of flight from poverty and persecution and the problematizing of irregular migration, mobility for business and pleasure is typically glamorized and encouraged in more privileged societies. The glamorization of elite mobility is part of broader processes of global capitalist consumption within conditions of neoliberalism, wherein circulation and accumulation within networks are unevenly experienced and materialized. Social capital is increasingly based on one’s power to be mobile and cultivate global networks which are usually referred to as network capital. In deeply embedded mechanisms of the social glamorization of mobility are uncovered, and juxtaposed with what we call a ‘darker side’ of hypermobility, including the physiological, psychological, emotional and social costs of mobility for individuals and societies. Mobility is omnipresent in our lives, there exists an ominous silence with regard to its darker side. The high social status associated with frequent corporeal mobility in some more privileged societies, specifically by air and road, is at least partly attributable to its glamorization in the media and other forms of public discourse. I am a flourishing hypermobile type. My frequent travel, with more than 200,000 kilometres covered for my work and for holidays in 2018 alone, is an integral part of my identity and a source of great satisfaction. The study left me with mixed feelings, perhaps because I am in that lucky minority. Usually, hypermobility is glamourized, while in fact, it has serious negative physiological, psychological, emotional and social consequences. Today, the day of your official transformation from Quantity to Quality carried away by this 9 grams of paper shielded in 140 grams of the holder is going to be a stronger date in your entire life. For most of them, it may be an end card, where for some it would be a beginning. Everyone is comfortable in their timezone; where time is linear and life is never meant to be such. I happened to visit the Keells Supermarket which was just a few meters away from my station this morning. The manager who greeted me was a bit friendly as I was the only customer and I wanted to get some paper packed juices for my breakfast. He was suggesting me few juice packs and directed me to the right section. When I reached that section, I saw different varieties of juices and started the usual Economist way of thinking and started my hunt. I saw a pack being labelled as 30 rupees which usually used to be 200 rupees in my hometown. Was delighted and grabbed two packs. Still, in my mind, I felt something fishy about it while I was walking to the counter. I realized and saw that the Best Before date was just 3 days ahead of today which means it has crossed 8 months and 27 days. I was taken a step behind to drop one among the two pack and it created a predicament for me in that store. On the same note, time is so powerful, when it isn’t perfectly utilized, the end user is affected with a very low retail value. 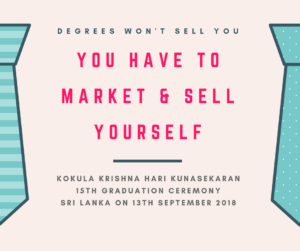 Degrees won’t sell you, it is you who have to market and sell yourself in this competitive world. Life isn’t the small ground for a race, it is much larger than what you actually think it is. Younger generation like us needs to run, run, run and jump the barrier and keep running. You need to have a greater excitement to execute things as if you never had them earlier. The driving force is within yourself and only this excitement can gear your force. People like me, meet you a day, throw some stones like what I said and make you feel more responsible and pressurized. Remember, I will not even be along with you for the post graduation celebration party. It is you who are going to run for the destiny, define it and dedicate your life for it. Your life is much more sacred than anything impacts you. Be choosy in everything you touch. This 149 grams crown which you are going to get today should teach about being choosy. And, this choosy everywhere. And your choice to be the final and declarable. I could recollect sometime ago in my life when I claimed as well as endorsed everyone as my friend. When time passed by, I learnt that no one treated me such and had been too self-centric. Now, after getting many experiences, I have finger countable people as my friends who will be able to do anything for my wellness. This is defined by the choice. While dusking my commencement speech, I wanted to enforce and reiterate Quality over Quantity. When your WhatsApp threads reach less than 10 a day and total groups are less than 5, yes you are progressing towards Quality over Quantity. When your friends’ list is 5000, and you restrict your chats for 10 people, you are progressing towards Quality over Quantity. When you have 40 people to hang around, you choose to keep 3 in your life, you are progressing towards Quality over Quantity. All the very best for your Future!